The artificial fur was flying at a world record pace when the Calgary Hitmen scored their first goal of the night Sunday. 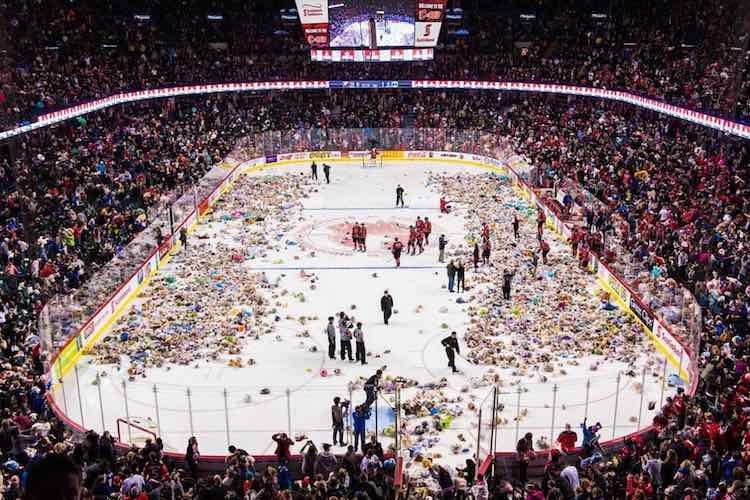 The goal was a signal for Canadian hockey fans to toss stuffed animals onto the ice– and the “avalanche of fur” went on for nearly two minutes, setting a new world record in the sporting world’s most unique holiday tradition. The junior hockey players, ages 16 and 21, may be considered amateur athletes, but they were pros at rounding up toys for underprivileged kids after being showered by 28,815 stuffed animals on the rink. The toy drive is set up for a Christmastime game each year, and this year, the charity was off the boards. There were 9,500 more toys than people at the game. Players dove into the toy piles and posed for photos on the fluffy donations for charity. The team donates what they collect every year to 50 Canadian charities which distribute toys to kids in need. The Hitmen have donated more than 300,000 stuffed toys in the past 21 years.